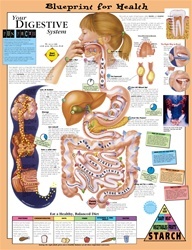 Illustrates digestive system by showing a 12-step path of food from bite to “the end of the line, ” and includes the role of each major organ in the process. Talks about teeth, their role in the digestive process and includes the right way to brush. Illustrates and describes the components of a healthy diet. Includes fun facts (“Borborygmy (Bore-bore-RIG-mee) is a word for the sounds your digestive system makes when it is working!") and includes answers to questions like “What is a burp?” and “Why do I throw up?” * Suitable for 8-12 year olds * Colorful, anatomically correct illustrations * Bright colors and bold figures make learning fun * Available in 2 mounting styles. For more info about chart mounting styles, click here.